Feel the soothing and serene environment of Sri Kedarnathji, where aarti and puja welcomes a new day. Worshippers need to reach Kedarnath on foot from Gaurikund. The great Pandavas founded this primeval temple. The outer area comprises of various statues of Goddess Parvati, Pandava and Goddess Laxmi. Moksha of Pitra or Shradha Tarpan is an important Indian custom, which is performed at Hanskund positioned close to Kedarnath Temple. Other popular holy places such as Amritkund, Uddandkund and Retas Kund are also located at a nearby area. To make the God happy, Brahmins keep performing lots of rituals whole day which makes the atmosphere extremely pious and soothing. Visiting Kedarnath is truly a spiritual experience. The temple of Kedarnath contains one out of the famed Twelve Jyotirlingas of Lord Shiva. The place is a unique opportunity to be with the Lord who is worshipped all over the world as destroyer of evil powers.Sivasthalangal of Kedarnath is where the Lord abides with his consort, Parvati to bless the devotees who come with pure minds and divine thoughts for attaining blessings of this divine couple. Among the Chardham religious tour, visit to Kedarnath is considered to be a Hindu Pilgrimage tour. Kedarnath land is a way to Swaraga, the heavenly aboard. It is from this place that Pandavas started their journey to heaven while still mortally alive. Lord Shiva rules over man during his lifetime and even after his death. At Kedarnath Ji puja is performed to seek blessings from the lord to provide Moksha to the departed souls. King Pandu, father of Pandavas left for heavenly abode from Kedarnath. Another tale related to the Jyotirlinga is that of lord Vishnu in the form of Nar and Narayan. Here one lord worships the other. Vishnu seeks boon by devoting long hours of penance to Kedarnath; as Nar and Narayan the two forms of the preserver ask lord Shiva to stay at the place for the benefit of suffering humanity. Kedarnath signifies the caring nature of Gods who time and again come down in one form or another to guide and save the human race from its own evil deeds and also deeds of others. Himalayas are abode of Gods. Lord Shiva has many temples dedicated to him in this holy region. 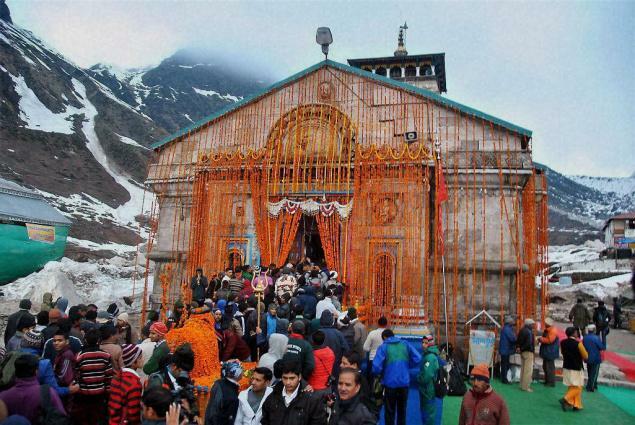 “Kedarnath Dham” is located among marshy terrain which is situated at a height of around 3583 m above sea level. The shrine temple is visited for Darshan of Shiva Jyotirlinga . There are 12 Jyotirlingas on Indian soils; Kedarnath is one out of these extremely holy Lingas. Shiva is one of the trinity, the other two being Lord Vishnu and Lord Brahma. Vishnu is taken to be the protector of the world, Lord Brahma creates the creation and Shiva the destroyer destroys it when evil exceeds all its limits. Shiva is a god who is pleased very easily. This is not a very good sign for the lord himself as he himself falls victim to his good nature in the hands of rakshas like Bhasmasura. A swayambhu Shivlinga was worshipped in Badrikashraya by Nar and Narayana, two manifestations of Lord Vishnu. Lord Shiva was happy to give Darshan to his devotees and promised to stay there in Kedarnath on their request for the good of mankind. From that day Jyotirlinga at Kedarnath became a pilgrimage for every Hindu. The Kedarnath Jyotirlinga is situated in Chamoli District which houses more than 200 small temples dedicated to the lord. Pandavas had worshipped Shiva at Kedarnath Dham during their exile period. The Jyotirlinga is eternal reality which exists in the Universe; lord Shiva partially emerges out of the Jyotirlingas. Shiva appears as a bright light emanating from these Jyotirlingas. Only a lucky few get to view this apparition. All the murtis from the temple at Kedarnath Dham are shifted to a place called Ukhimath. The Lord is worshipped here for six months. The place is known as Paadal Petra Sthalam. State of Uttarakhand is truly blessed with Kedareshwar Dham on its soils. Snowy landscape around the temple offers a picturesque view of the land. More and more people are able to visit the tough terrain due to efforts of tourism industry. Feel yourself close to God at Sri Kedarnath Ji! Devotees from far away come here to seek the blessings of Lord Shiva and Goddess Parvati. Worshipping them leads to get rid from the entire evil omen and attaining spiritual enlightenment. From the month of May to October, the beautiful and pious town of Kedarnath is at best. The devotees would be able to enjoy trekking as the weather is pleasant. On the contrary, it will be tough to travel in winters, as they are extremely cold. Kedarnathji has various small shops with lots of Gods, Goddess and temples photograph, such as Kedarnath and Badrinath. Rudraksh Mala is very sacred for Hindus. You can buy genuine Rudraksh mala from Kedarnath. Souvenirs are also available along with crystals, Saligrams, herbs, Shilajit, natural Vitalizers, precious stones and Tulsi beads for the devotees. The beautiful home of Lord Shiva and Goddess Parvati is connected by road to all the major cities of India. Nearest Rail: Rishikesh and Kotdwar positioned at a distance of 234 kms and 260 Kms resp.